What if I told you there was a diary-free, gluten-free, nut-free, vegan, plant-based, low carb, and low calorie milk alternative? Enter the wonderful hemp milk. Hemp milk is a really great option, as making it at home is very quick, easy, and affordable. Ohhhh, this stuff. Is so good. And I don’t even mean good from the standpoint of taste, which is factor #1. But hemp is so good for you. I will try not to make this post too long, but will answer a few basic hemp questions (concerns) and will get to the recipe, I know that’s why you’re here! How Does Hemp Milk Taste? If I’m honest, it can have a bit of an “earthy” or “green” taste. I don’t know exactly how to describe it, but if you’ve ever eaten something and it reminds you that it’s raw, you’ll understand. It is a fairly mild taste, but if you try it and don’t prefer it raw, I have added a few sweetener options to make it taste better. I think I’ve even gotten used to the taste so that I really don’t taste it any more. And, in my high-speed blender, it makes it mine so very frothy and smooth and amazing. Some people say that theirs curds when it gets heated; I have not noticed this, but I usually mix it well. However, you may have to stir/shake your mug frequently if your drink sits around for a while. Why is Hemp Milk Better Than Nut Milk? Two reasons: 1. Nutrition – the nutritional benefits are really high, plus most people are not allergic to hemp like they are nuts. 2. No soaking required. I can make hemp milk immediately without having to wait any soaking time like with nuts. What are Hemp Seed Nutritional Benefits? Hemp seeds are so nutritious, it’s hard to list it all. In addition to being anti-inflammatory and not a typical allergen like nuts, hemp seeds are low-carb, have lots of protein, and are keto-friendly. Hemp is a complete protein and contains all of the essential amino acids in the ratio that the human body requires. It also a good source of Vitamin E, which can boost the immune system and red blood cell formation. Will I Get High or Fail A Drug Test from Hemp? This study shows that, although there are very small traces of THC, the main active ingredient in marijuana (cannabis), hemp seeds that meet US processing standards have very little effect on THC levels, not enough to get you high and should not make you fail a drug test. You can usually get hemp seeds at any natural foods store, occasionally a grocery store. I try to buy organic produce as much as possible, and I have used these organic hemp seeds and really like them. I also feel like the taste is a tad less earthy-tasting than other seeds I’ve used in the past. 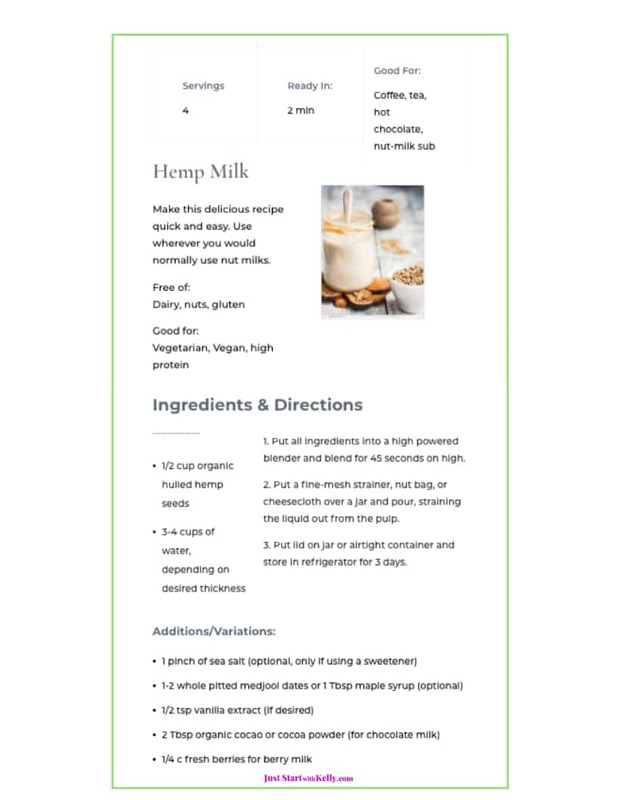 You can generally use hemp milk in place of any homemade nut or coconut milk. It can be used in smoothies, as a coffee creamer, on granola or cereal. I use it to make this sugar-free homemade hot chocolate. 1. Put all ingredients into a high powered blender (I use this one) and blend for 45 seconds on high. 2. Put a fine-mesh strainer, nut bag, or cheesecloth over a jar and pour, straining the liquid out from the pulp. 3. Put lid on jar or airtight container and store in refrigerator for 3 days. Have you tried hemp milk? How do you like it? I would love to know if you tried this recipe, please let me know in the comments section below! If you have more questions about hemp, let me know that also!